​Marco Sonzogni (Dr) was educated at the Università degli Studi di Pavia (Almo Collegio Borromeo), the National University of Ireland (Dublin), the University of Dublin (Trinity College), Victoria University of Wellington and the University of Auckland. He’s an award-winning poet, literary translator and editor and currently Senior Lecturer in Italian at Victoria University of Wellington, New Zealand. He has been the recipient of several translation awards, including the Looren Translation Grant and the Pro Helvetia Translation Grant, in recognition of published translations as well as on the merits of an ongoing translation projects. In 2013 and in 2014 respectively, the Republic of Italy and the Republic of Poland bestowed on him the Order of Merit for services to culture. 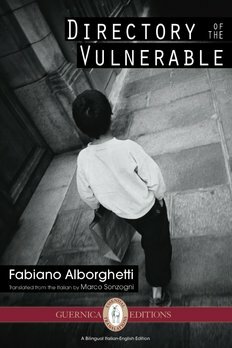 Fabiano Alborghetti represent almost an anomaly, if not a challenge, in the world of contemporary Italian poetry. The anomaly consists largely in the poet’s adoption of a voice (or voices) other than his own, in the process divesting himself of his poetic persona to invest in the cultural and linguistic expropriations (and reappropriations) that such borrowed voices represent, whether they belong to the tattered margins or the dead center of society. Making such adoptive voices redemptive is a high-risk investment, and it is more so for a poet than for a prose writer. ‘Directory of the Vulnerable’ , with a painful lucidity Alborghetti tries to comprehend and, yet again, he chooses direct observation and personal exploration, not so much of the protagonists of the drama, who are unavailable (or describable only in the distorting mirrors of journalists’ disinformation) but of the place which by way of allegory, contains and channels the tragedy. the author follows the customers, and families in particular; he spies on their choices, movements, records fragments of their dialogues, their likely dreams, their inevitable catastrophes: he does this within the concrete reality of the shop, and the streets of the it y or the suburb, and also within the virtual reality of television and internet sites, via the cruel creation of spectacle that in recent decades has foraged hysterically in the sorrows.